Roger de Flor’s Catalan Company went to war in 1302 for a dangerously fragile Byzantine Empire. 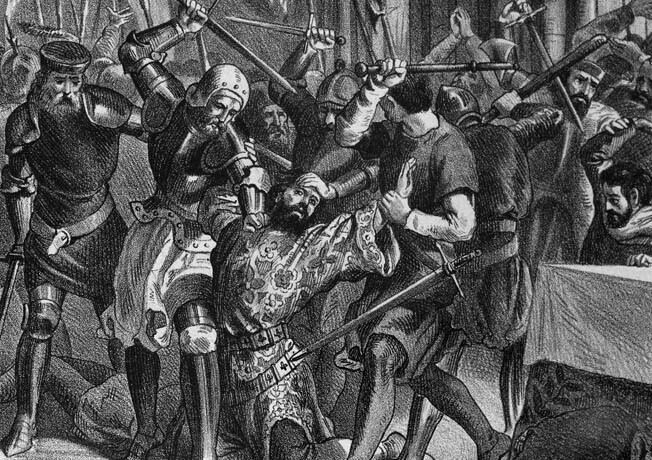 An assault on an Alan woman by an Almogavar of the Catalan Company exploded into a skirmish between the two groups of allies in the pay of the Byzantine Empire on April 9, 1303. The incident occurred at Cyzicus on the southern shores of the Sea of Marmara, a short trip by boat from Constantinople. This was no fist fight; rather, the scuffle was fought with swords and daggers. Some of the Alans attacked the Almogavars, and the latter counterattacked, driving those who initiated the assault into their multistory barracks. The allied army, under the command of Grand Duke Roger de Flor, contained far more Almogavars than Alans. 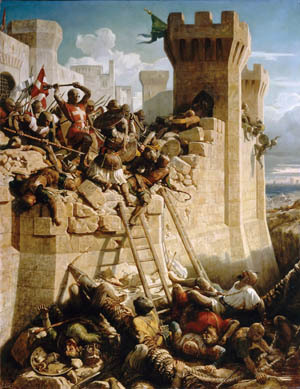 As the Almogavars sought to batter down the doors, the defenders grabbed stones and tiles and dropped them from the rooftop and windows onto the attackers. The Almogavars broke down the doors, overwhelmed the Alans, and drove them from the building. The unfortunate incident left several hundred dead in the area where the fighting occurred. Among the dead was the son of the Alan chieftain. The chieftain, who contemporary accounts name only as George, was inconsolable. De Flor went to him immediately and apologized for the deaths. The grand duke offered gold in compensation for the death of George’s son, but the grief-stricken chieftain refused. He regarded the offer as an additional insult. Of the surviving Alans, one-third refused to continue fighting alongside the Almogavars against the Turks. De Flor usually looked the other way when his troops provoked rivals or mistreated the people they had been hired to protect. He and his men were cut from the same cloth. At the time, 35-year-old de Flor was “a man in the prime of his life, of terrible aspect, quick in gesture, and impetuous in all his actions,” wrote 13th-century Byzantine Greek historian George Pachymeres. In the case of the bloody riot at Cyzicus, de Flor’s laissez-faire attitude toward the barbaric behavior of his men would have dire consequences. De Flor was the son of Richard von Blum, a falconer who was a member of the household troops of Holy Roman Emperor Frederick II. Unlike most of the Holy Roman Emperors who lived in Germany, Frederick Hohenstaufen was born in Italy. He inherited the Kingdom of Sicily from his mother, which gave him control of Sicily as well as a large part of southern Italy. After Frederick’s death in 1250, Blum served Frederick’s illegitimate son Manfred, who became King of Sicily. Blum married a maiden named Beatrice who lived in Brindisi. The Papacy despised the Hohenstaufens, and they recruited Count Charles of Anjou, the youngest brother of French King Louis IX, to oust King Manfred from the Sicilian throne. Charles subsequently invaded the kingdom in 1266 and killed Manfred at the Battle of Benevento. The following year Beatrice gave birth to a son she and her husband named Rutger, which later became Anglicized to Roger. When Frederick’s grandson Conradin Hohenstaufen arrived from Germany and tried to regain control of the Kingdom of Sicily from Charles, Blum died fighting the Angevins in the Battle of Tagliacozzo in 1268. Beatrice returned to Brindisi where she and her son lived hand to mouth. The young boy loved to play on the ships tied to the wharf. The captain of a galley belonging to the Knights Templar offered to teach Roger to be a sailor. With no better future in store for him, Beatrice agreed. At the age of eight, he joined the crew of the galley in 1275. In the following years, Roger learned to navigate a ship. When de Flor turned 20, he joined the Knights Templar as a sergeant brother. The Templars assigned him to serve as captain of a supply ship. He frequently put in to Famagusta, Cyprus, and he married a woman on the island who gave him a daughter. During the harrowing siege of Acre by the Mamluks in April-May 1291, he fought on the walls for a brief period. In the final days of the siege, he allegedly charged exorbitant fees to noncombatants bound for Famagusta to escape the imminent fall of the city to the bloodthirsty Muslim hordes. He was alleged to have not only taken gold and silver, but also all of the jewels of the French ladies he ferried to Famagusta. When the Templars learned that he had accumulated substantial personal wealth, they further accused him of stealing money from their coffers, even though the money he had in his possession may have been amassed entirely through exorbitant fares. With charges of theft and embezzlement hanging over his head, de Flor resigned from the military order. That was not the end of the matter, though. The Knights Templar shared the results of their findings with the Papacy, and Pope Boniface VIII branded him a thief and apostate. Having been raised at sea where lawlessness was rampant, it is not surprising that his morality was different from that of the rigid Catholic military order. De Flor eventually wound up in Genoa where a sympathetic merchant named Ticino Doria helped him purchase a ship. The fallen Templar subsequently embarked on a career as a pirate aboard his vessel Olivettausing the name Friar Roger. He enjoyed substantial success. He kept many of the boats he captured, and ultimately headed an entire pirate fleet. At the time the western Mediterranean was in the middle of a protracted conflict that pitted Angevins and Aragonese against each other for control of the Sicilian crown. In 1282, the Aragonese had taken control of the island of Sicily, leaving the Angevins in control of the mainland portion of the Kingdom of Sicily. Frederick III of Sicily continued the war against the Angevins that his father King Peter III of Aragon had begun. Frederick needed another skilled admiral and hired de Flor at some unspecified point in the mid-1290s and gave him the rank of vice admiral. During the siege of Acre de Flor was branded a thief. When the War of the Sicilian Vespers between the Angevins and Aragonese concluded with the Peace of Caltabellotta in 1302, Frederick had thousands of unemployed Almogavars on the island. When word reached him via Genoese merchants that Byzantine Emperor Andronicus II Palaiologos was in desperate need of experienced mercenaries to hold back the Turks in Anatolia, he arranged for de Flor to lead the Almogavars to Byzantium. De Flor demanded that the Almogavars receive twice the pay normally given to Byzantine mercenaries. Andronicus agreed. The cost of the ships and equipment to transport the Catalan Company was financed by King Frederick, de Flor, and a loan of 20,000 ducats from Genoese financiers. De Flor set sail later that year at the head of a 39 galleys and transports that carried the 6,500 men of the Catalan Company to Constantinople. The Almogavar foot soldiers hailed from Navarre, Aragon, and Catalonia. They had fought in the Reconquista, as well as the War of the Sicilian Vespers, in which they fought for the Aragonese. They were armed much like Roman soldiers with javelins and short swords. The Almogavars had a reputation for ferocity in battle, and they could fight equally well either in open formation as skirmishers or in closed formation as main force infantry. The Almogavars of the Catalan Company “died hard in battle and were ready to gamble their lives,” wrote Pachymeres. When under attack or going into battle, each soldier banged his weapons together above his head and collectively they shouted, “Aur! Aur! Desperta Ferre!”(“Iron, awake!”). Andronicus was the son of Byzantine Emperor Michael VIII Palaiologos, who had recovered Constantinople and revived the Greek Byzantine Empire in 1261 from the Latin rulers who had controlled it for nearly six decades following the Fourth Crusade. On the whole, the Byzantines had a deep distrust for Latin warriors given that the Latin Crusaders and Venetians had conquered and sacked Constantinople in 1204 and installed one of their leaders as emperor. The Palaiologos ruled the Empire of Nicea and crushed a Latin alliance at the Battle of Pelagonia in 1259 that led to their recapture of the imperial throne. The Byzantine Empire that Andronicus inherited was nothing like the empire that existed at the time of the First Crusade. It controlled less territory in Europe, and it lacked a strong army and navy. When the Catalan Company arrived it was merely a minor regional power trying to maintain its frontiers against constant incursions. Andronicus had made his son Michael IX Palaiologos co-emperor to help him govern the empire and wage war against the Turks. A blessing of sorts occurred in 1301 when 5,000 Alan warriors arrived on the northern border of Byzantium and petitioned the emperor for permission to enter and serve in its army. Andronicus allowed them to enter, and they were assigned to help protect the eastern frontier in western Anatolia; however, they performed poorly. The matter reflected badly on Michael IX because he was responsible for the overall defense of the empire’s frontiers in Europe and Asia. Christian refugees were crowded along the western coast of Anatolia, and the Byzantine towns were besieged by Turkish armies. The Byzantines lacked a gifted army commander, and Andronicus believed de Flor could defeat the Turks. He bestowed upon de Flor the title of grand duke. He also approved de Flor’s request that one of his senior officers, Ferdinand d’Aones, be given command of the fleet supplying the company’s Anatolian expedition. The Almogavars had no sooner arrived in Galata, the Genoese suburb opposite the Golden Horn from Constantinople, in September 1302 than they became involved in a street fight with the Genoese. The Genoese served as the de facto navy for the Byzantines. When their sailors and marines discerned that the Greeks were giving the Almogavars preferential treatment, they initiated the brawl. The fight escalated to the point that a Genoese officer named Roseo de Final deployed his banner. At that point, the Almogavars counterattacked with a vengeance, slaying de Final and many of his troops. The Catalan Company debarked at Cyzicus where a Byzantine force partially composed of Alans was bottled up on the Artaki Peninsula behind a defensive wall that ran the width of the isthmus. A large army of Karasid Turks attacked the wall each day. After learning that their main camp was six miles to the east, de Flor conducted a night march that brought his army to the fringe of the camp just before daybreak. De Flor had 8,000 Almogavars and Alans against 15,000 Turks. The grand duke led the armored cavalry, while Seneschal Corberan d’Alet led the Almogavar infantry. The Latin mercenaries launched a spirited attack at dawn, catching the enemy by surprise. The Turks’ main weapon was the bow and arrow. The Almogavars rushed them to minimize the amount of time they would have to endure the shower of arrows the Turks fired at them. Most of the Turks fled once they realized that they could not stand up against the better led Latin soldiers. Those who did try to make a stand fought in small groups on the plateau where their tents stood. They were slaughtered as the Almogavars gave no quarter. Unfortunately, most of the Turks escaped. When news of the great victory reached Constantinople, Andronicus and his wife Princess Irene celebrated. The Almogavars returned to Cyzicus where they remained during the winter months. They behaved in a boorish manner toward the Byzantines living on the Artaki Peninsula. They looked down on the Greeks simply because they were weaker soldiers. A senior officer of the company, Ferdinand Jimenez D’Arenos, complained to de Flor of the Almogavars’ behavior, but the commander-in-chief of the army refused to take any disciplinary action. The Almogavars of the Iberian Peninsula were among the Mediterranean region’s best fighters. The bloodthirsty mercenaries were eager for fresh conquests at the conclusion of the War of the Sicilian Vespers. In March 1303 de Flor met with Andronicus in Constantinople. His orders for the spring campaign were to relieve the city of Philadelphia 220 miles south of Cyzicus, which was besieged by a large Turkish army. While final preparations were being made for the overland campaign, rioting broke out between the Alans, who also were encamped on the peninsula, and the Almogavars. The death of the Alan leader’s son earned de Flor the lifelong animosity of the Alan general. By that point both the Alan leader and Michael IX wished him dead. The besiegers of Philadelphia were mainly Karamanlides, whose homeland lay far to the east in central Anatolia. They were awed by the Catalan Company’s “military discipline, the gleam of their weapons, and the superlative elan of the Latins,” noted 14th-century Byzantine historian Nicephorus Gregoras. Even though they lacked the discipline of the Almogavars, the 20,000-strong Turkish army nevertheless offered battle. De Flor was heavily outnumbered, but he did not hesitate to attack, given that he had complete confidence in his men. The Turkish light cavalry, although numerous, was unable to defeat the more heavily armored Catalan cavalry. Once again the Almogavar infantry rushed to engage the enemy infantry and swept them from the field. The Turks lifted the siege and withdrew. De Flor’s losses amounted to 180 men. De Flor was hailed by Andronicus and those whom he had saved from the clutches of the Turks as “The Deliverer of Asia.” After the relief of Philadelphia, he cleared the Turks from southwestern Anatolia, securing a number of key towns, including Ephesus, Magnesia, and Sardis. De Flor then returned to Magnesia on the Meander River, which served as his headquarters in Anatolia. He began to plan a new campaign by which he would retake the southern coast of Anatolia from the Turks. In the spring of 1304 de Flor led his Byzantine army through southern Anatolia to Konya where the army turned east on the road used by the Latin Crusaders. This road led to the Cilician Gates in the Taurus Mountains. For most of their march, the Turks maintained a safe distance, but they launched a major attack on de Flor’s army just before it entered the mountain pass known as the Iron Gates of Cilicia. The two sides fought a day-long battle at Cybistra in which the Latin troops emerged victorious. Although some of his senior officers tried to persuade de Flor to focus on setting up his own principality in Anatolia, he remained loyal to Andronicus. After receiving thanks from Armenians who rejoiced at his victory over the bothersome Turks, de Flor returned to his base at Magnesia. 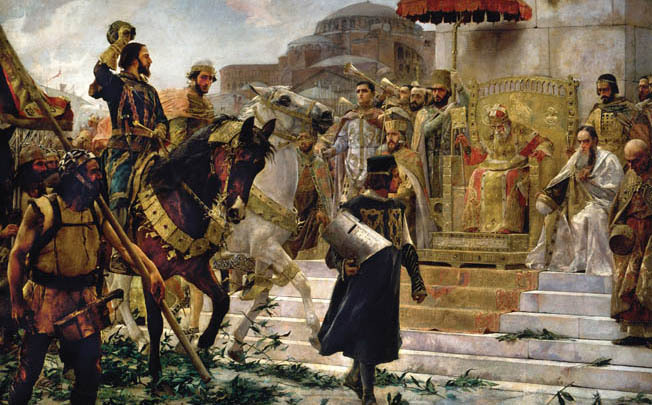 At the end of the campaigning season, Andronicus summoned de Flor to Constantinople. De Flor took a picked force of Almogavars with him, and they bivouacked at Gallipoli. This time the emperor had difficulty raising the money to pay the Catalan Company. Because of that, de Flor instructed his Almogavars to plunder the area and take what they felt was due them. It marked an end to the mutually beneficial understanding that Andronicus and de Flor had shared. In further negotiations with Andronicus, de Flor coerced the emperor into promoting him to the lofty rank of caesar with authority over the Byzantine territories in Anatolia. When Michael IX learned of this, his hatred for de Flor reached new heights. Byzantine co-emperor Michael IX Palaiologos, who loathed de Flor, orchestrated his murder in 1305. Shortly afterward, Michael IX invited de Flor to attend a lavish banquet. The Byzantine co-emperor had previously refused to meet with de Flor, and so it came as a pleasant surprise to the Almogavar leader. To ensure his safety, he took 300 Almogavars with him. When the Latins arrived at the banquet on April 30, 1305, they found themselves greatly outnumbered by the Alans in attendance. Almost immediately the Alans attacked the Almogavars. In the ensuing bloody skirmish, the Alan leader who had a vendetta against de Flor for killing his son made sure that de Flor was hacked to death by his men. The Almogavar forces in Byzantium revolted immediately. Command devolved to senior commander Berenguer d’Entenza. 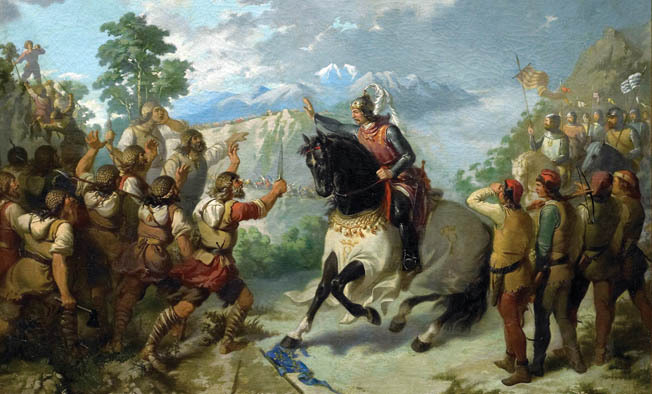 The Catalan Company won a decisive victory three months later over Michael IX’s Byzantine army at Apros in Thrace. This marked the beginning of what became known as the “Catalan Vengeance.” During the next four years, the Catalan Company ravaged the Byzantine territories of Macedonia and Thrace. In the eyes of the Roman Church, the Almogavars’ brutality exceeded the bounds of accepted warfare. Branding them “senseless sons of damnation,” Pope Clement V excommunicated them. Duke Walter of Athens eventually hired them as mercenaries, but they turned on him, too. The Almogavars defeated and overthrew the duke at the Battle of Cephisus in March 1311. Thereafter, the Catalan Company took control of the Duchy of Athens. To give their rule a sense of legitimacy in the eyes of the Latin world, they chose King Frederick III of Sicily as their sovereign, and he appointed his son Manfred to serve as its duke. The duchy remained under Aragonese control until 1388. Although the territory in Anatolia that de Flor had conquered quickly reverted to Turkish control, de Flor and his successors showed that a well-led, crack force of mercenaries could reverse the downward spiral of a kingdom or empire. The Catalan Company’s feats inspired mercenaries throughout the following centuries. Tags Alans, Allies, Almogavars, Armenia, army, Asia, Athens, Byzantine Empire, Byzantium, Cata, Catalan Company, cavalry, CIA, Company B, Company E, Company F, Constantinople, Crusader, Cyprus, dagger, EAM, Eastern Front, Europe, First Crusade, Frederick Hohenstaufen, Frederick II, French, Gallipoli, general, German, Germany, Greek, Iberian Peninsula, Italy, javelin, King Louis IX, King Manfred, knights, knights templar, mace, Macedonia, Marines, Mediterranean, military, Military Heritage January 2018, Muslim, NATO, navy, Ney, NSA, OSS, Overland Campaign, Peter III, POW, Reconquista, river, Roger de Flor, Roman, roman soldier, roman soldiers, sam, Sicily, Siege of Acre, sword, swords, Tern, The Eastern Front, Thor, Thrace, Tory, turkish, weapons, WIN, XCOM.